Six club hikers left the parking lot headed west. There are several use trails that may be taken through Ash Meadow and we took the most worn one until we crossed Ash Creek. 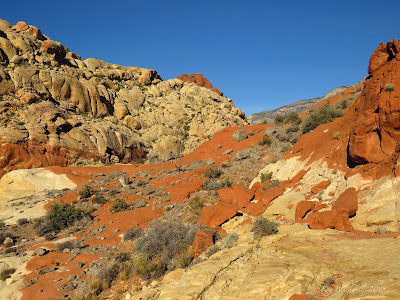 Then we sighted the bottom of Dragon Canyon and followed a vague trail up to the entrance. 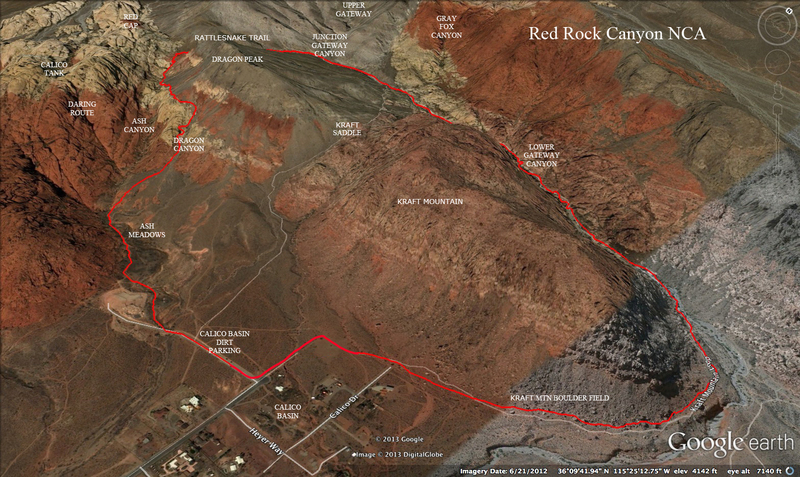 This trail takes hikers up the canyon on the right (north) side. 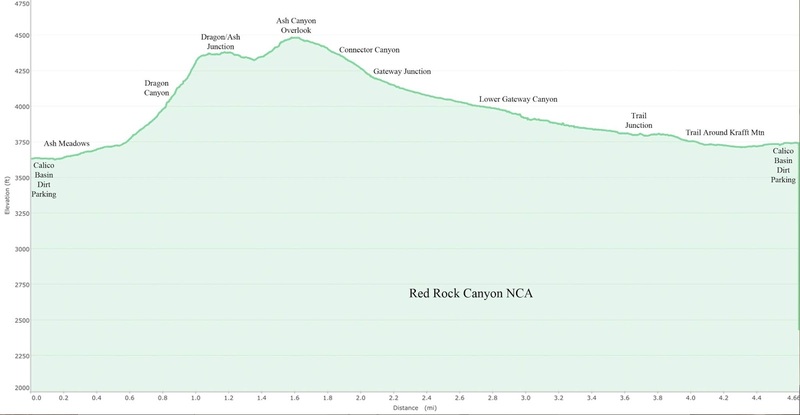 Hikers take different routes up through the canyon because it offers different levels of workout. Some take the trail. Some take the wash. And, some take the far left third class scramble. As I was taking bits of the wash and bits of the trail, I spied a tarantula crawling toward my feet! He was a big guy! Moving on, we all got up the canyon and topped out at the overlook where Red Cap was in view around the corner and Ash Canyon was down below the cliff. A short breather put us back on the trail toward the intermediate high point of Ash Canyon. 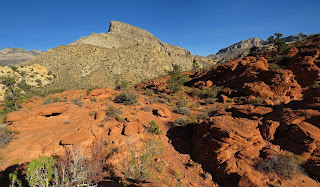 From there, we took the remaining Ash Canyon Trail up to the saddle where we took another breather. Good and beautiful climb! 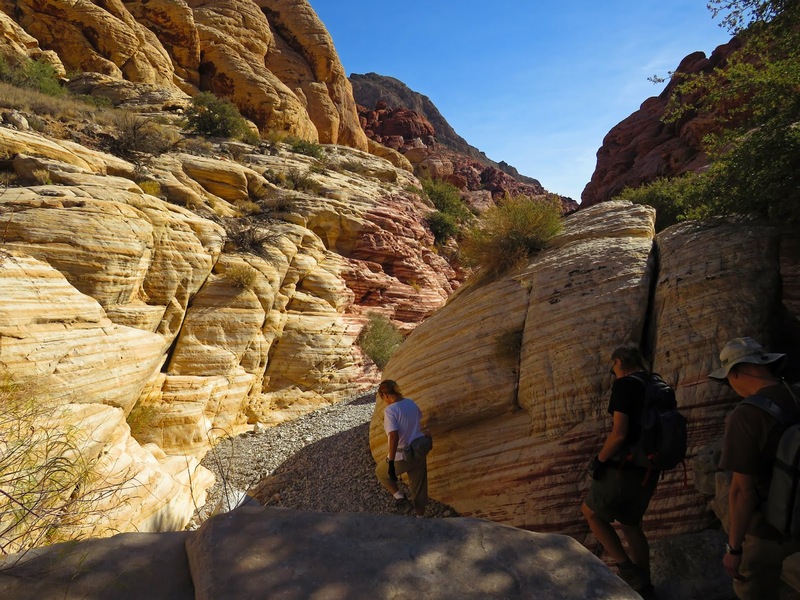 Around this corner to the north, is a connecting wash with a great view of Gray Cap and the ridge that separates Gateway Canyon and Brownstone Canyon. The connecting wash has a trail called Rattlesnake Trail ... not to be confused with Rattlesnake Canyon that is located at Willow Springs. After a brief break, we started down Rattlesnake Trail toward Gateway Canyon. Midway, in the wash, we stopped for our official break among lots of large rocks to sit on in the shade. We continued down the wash to where it junctions with Gateway Canyon. 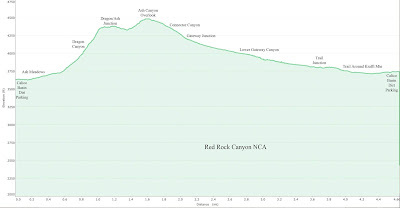 Rattlesnake Trail continues down canyon until you reach a very large cairn and a right turn that leads up the hill. Here, the trail takes you over the Kraft Saddle and back to the trailhead. If you make a left turn (up) at Gateway Canyon, you are on your way to lots of great limestone scrambling and a different adventure all together. We turned right and headed down canyon. The sliding board obstacle was great fun! Then we continued past where the Rattlesnake Trail continues to the right. Soon, we were heading into the amazing calico rock of lower Gateway Canyon. We saw several other recreational hikers on this part of the morning's route. Kraft Mountain Loop is very popular among hikers because of this section of the canyon. On our way past the junction with Gray Fox Canyon on the left side, we passed new trail signs for the shortcut up to the saddle that we have taken for many years. Finally, I guess, the shortcut trail is official! The summer rains made their impression in lower Gateway. They always do! Every year, the gravel is moved around making old obstacles slightly different. This year, most of the obstacles were made easier with the exception of just a couple that were slightly harder. These were places where the gravel had been washed out a little at the bottom of a drop. Still, all was very doable and we concentrated on enjoying the scenery. (Pickle Rock remains easy this year! Sliding Board is a little deeper. And the huge obstacle area seems different somehow.) 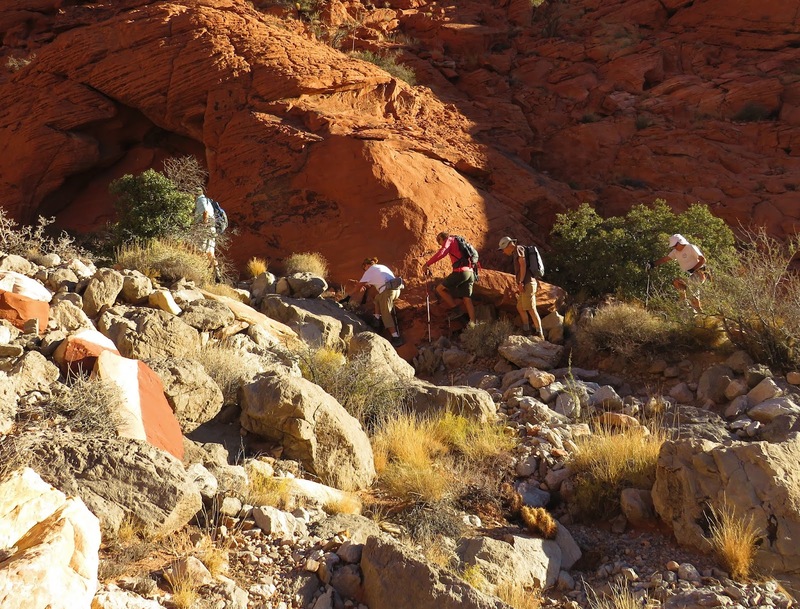 Each obstacle provided a certain amount of fun as we mingled among other hikers and a brave little dog. Turtlehead Peak reigned over the top end of the canyon and every time we turned around, we were rewarded with a beautiful view. Too soon, we came to the bottom of the canyon where the Kraft Mountain Loop Trail turned to go around the east end of the rocky mountain. We were immediately put into the bouldering genre of activities. The Saturday boulderers had claimed almost every large climbable boulder in the Kraft Mountain Boulder Field. We stopped to watch a couple of groups that gathered around the rocks encouraging the climber in the spotlight. It looks like so much fun .... But, alas, we had packs on so we didn't try it! 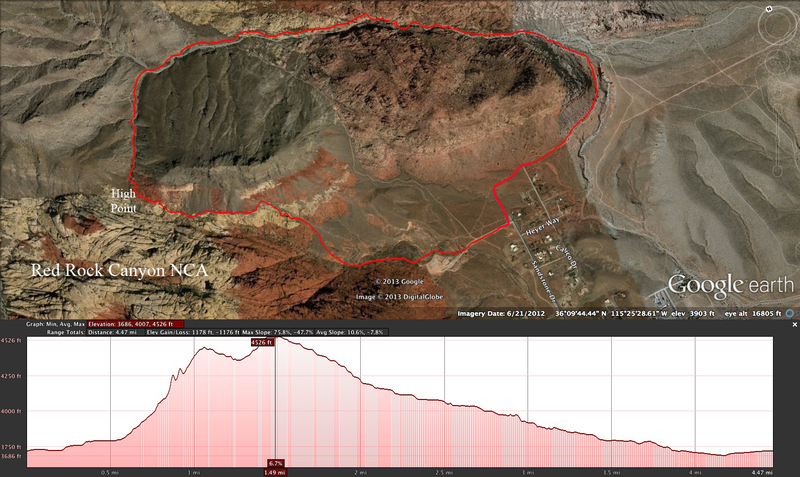 😁Our route finished by following the trail through the desert and back to the cars. By now, there were cars everywhere! A park ranger was there, also, making sure the cars all parked legally. Fun day!